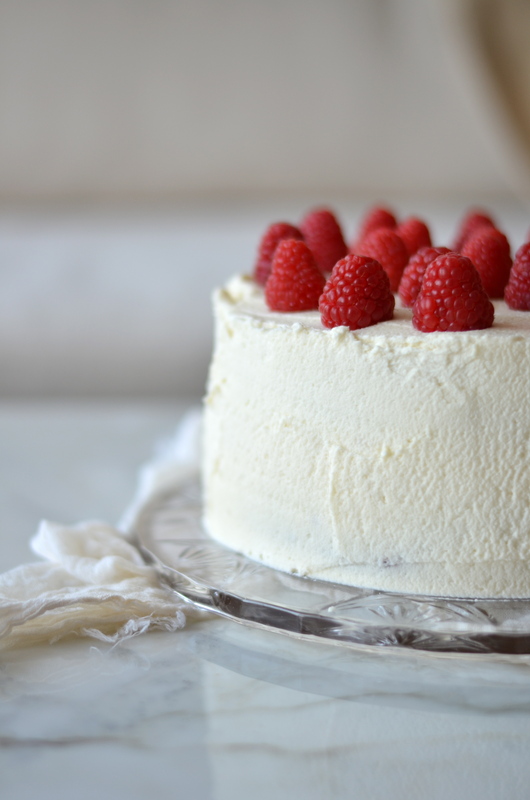 This is THE cake of your dreams. I promise. 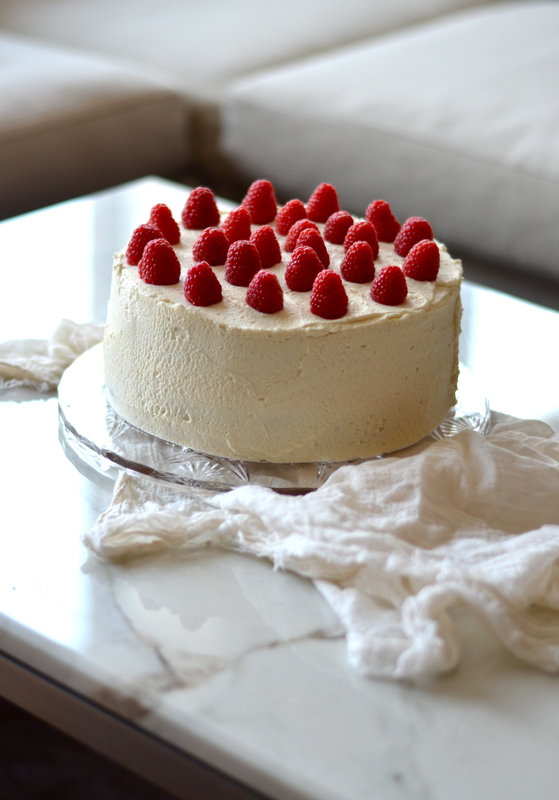 I never want to make and then consume another cake or frosting ever again. This cake is too good. 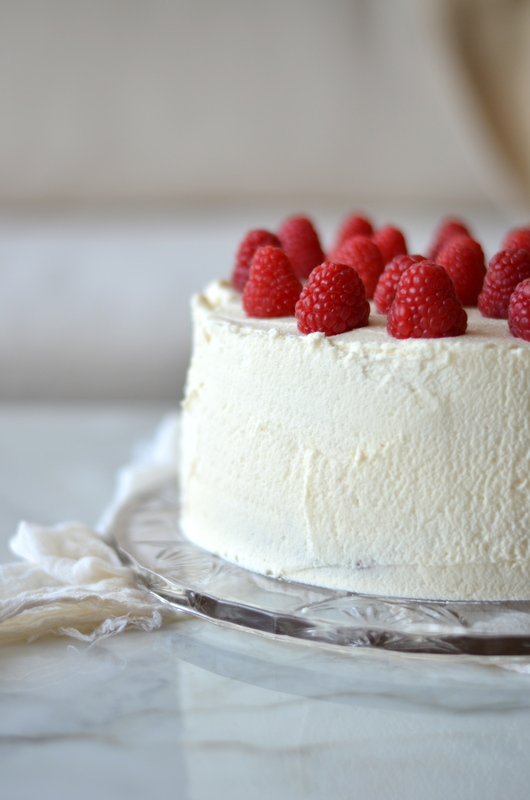 I saw a cake like this and loved how pretty it was but couldn’t find a recipe that I liked. I looked for months. Then finally, I found it. 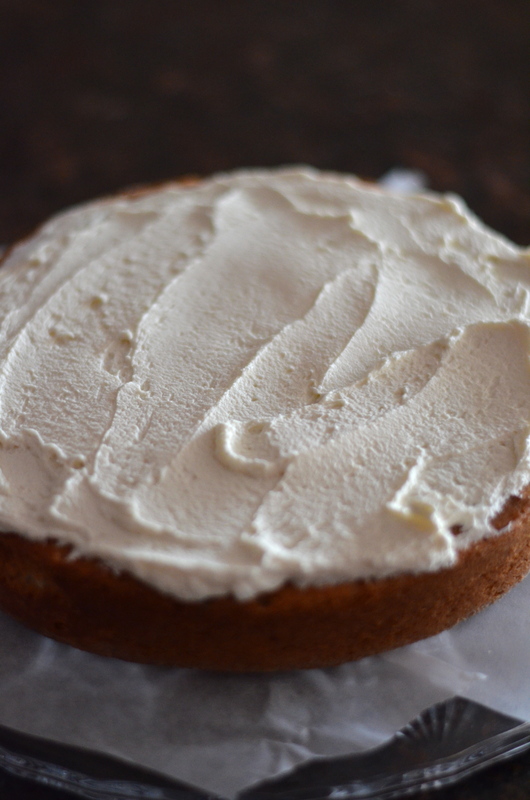 With a few little tweaks I’ve found what is the best white cake/frosting combo of all time. You choose the fruit/filling of your choice and I promise you dreams will come true. 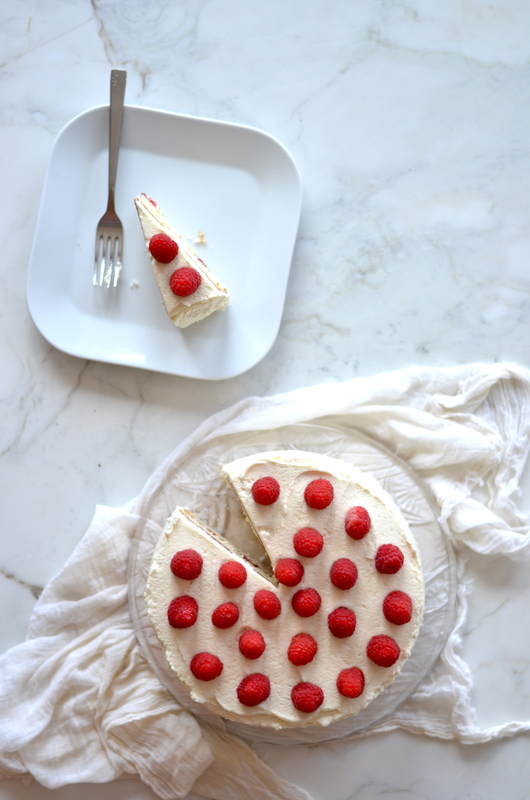 The older I get the more I like fruit with my dessert (I literally remember being so annoyed when all the old church ladies would bring lemon bars and fruit desserts to all the potlucks and now I’m starting to get it. Plus there’s the diabetes I guess…). Don’t get me wrong, fruit certainly isn’t a necessity in my desserts. I literally just sat on the couch and ate an entire sleeve of graham crackers dipped in Nutella while binge watching Netflix. Damn you Netflix for nurturing my bad habits. 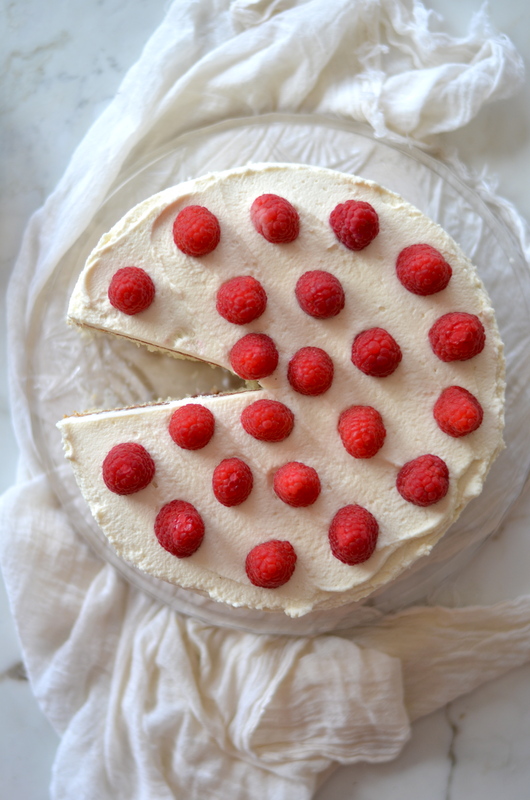 Fruit desserts just seem to be creeping their way higher and higher on my list (but it’s fruit which means it’s healthy). I just had a terrifying realization…I was about to reminisce about how it’s totally cool to devour garbage foods while binge watching Netflix because winter is on the way and that means I can hide myself under sweaters and baggy clothes…wrong!! I have to wear yoga clothes and be an example of health…what have I done!? JK…(for the most part). Yoga is the greatest thing ever and it actually helps me eat way healthier when I know I am headed to class or to teach! But even yoga isn’t going to stop me from eating all the cake at all times of the morning, day and night! Aren’t you obsessed with these pictures. 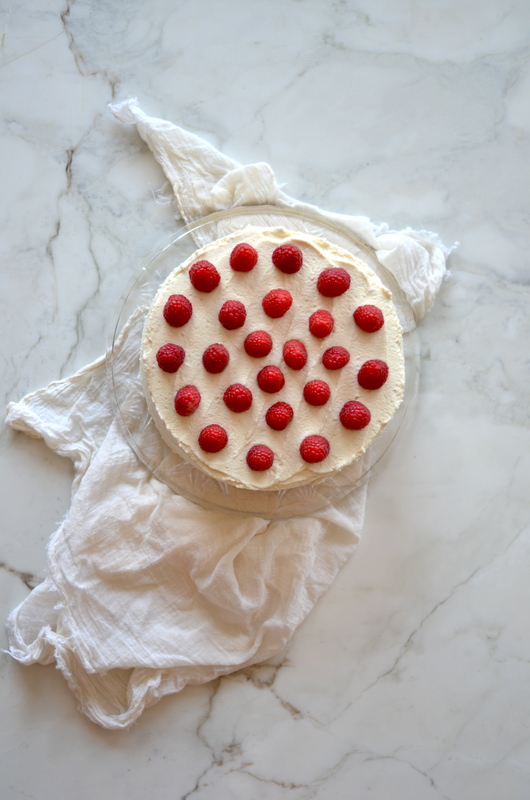 The raspberries look sooooooo pretty. 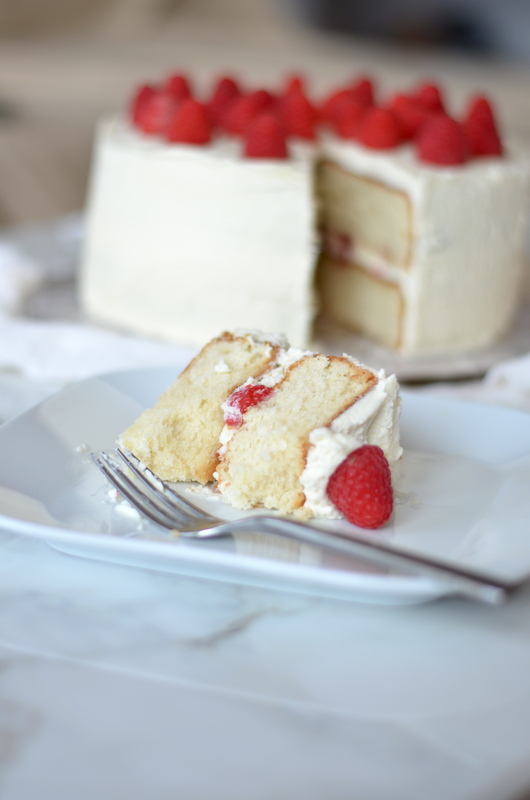 And seriously this cake tastes even better than it looks! 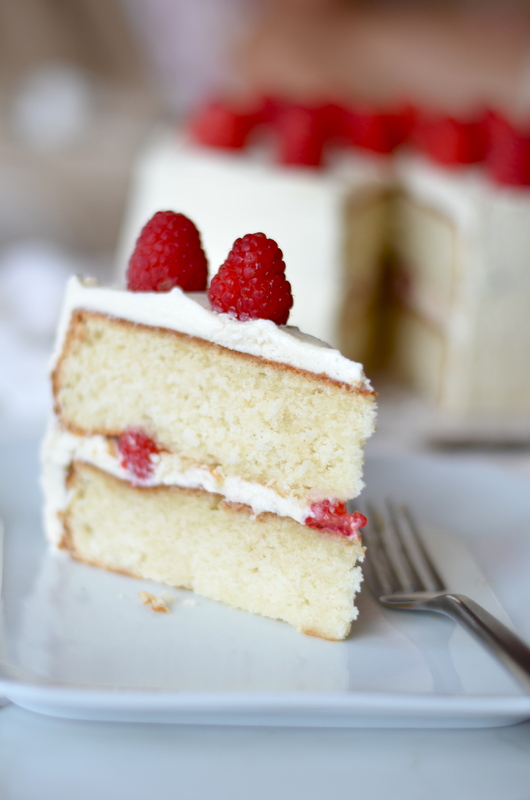 And then you slice into it…and it is filled with even more beauty. 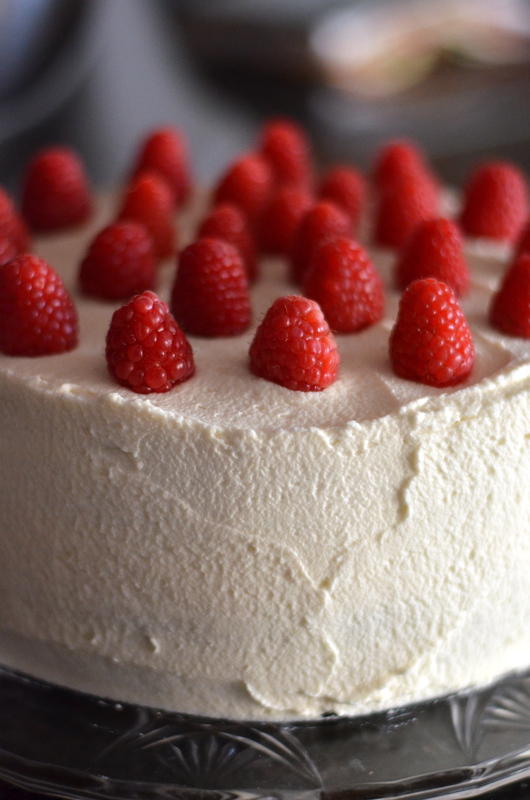 More raspberries and MORE frosting. 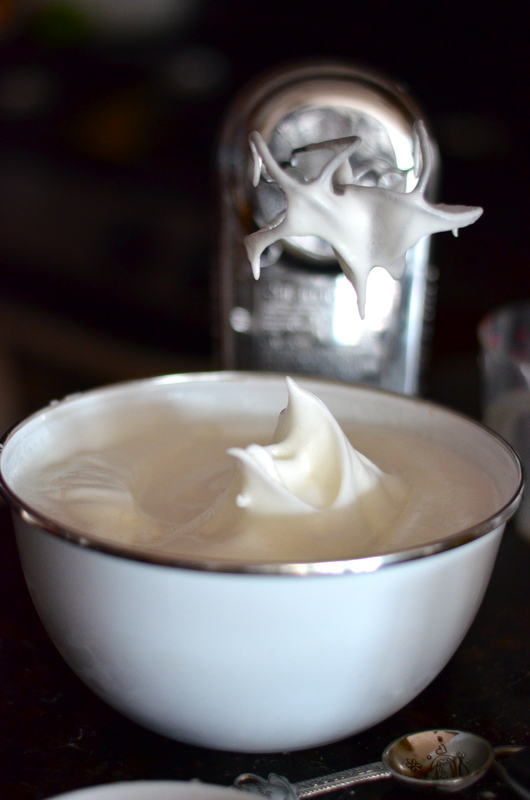 This frosting is soooooooooooooooooooooooooooooo good. I ate that on graham crackers too…and then I ran out of grahams so I just switched over to regular crackers. I HAVE A PROBLEM. 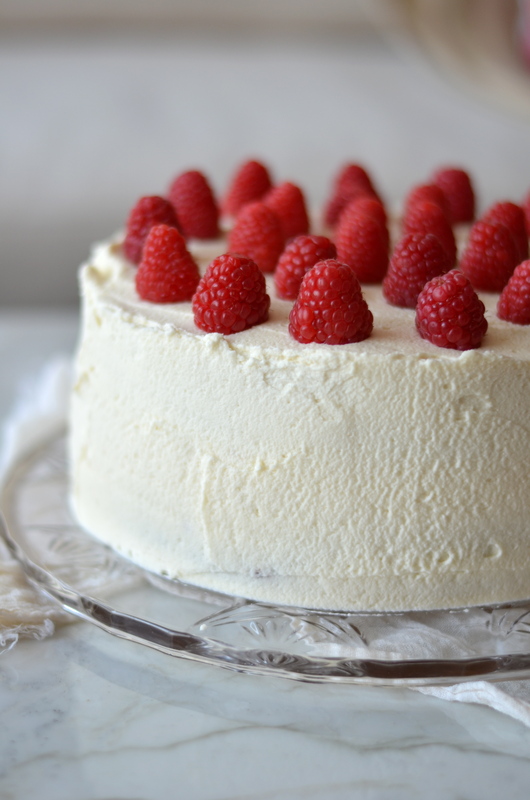 You could also mush up the raspberries for the middle/filling of the cake if you wanted more raspberry in every bite. 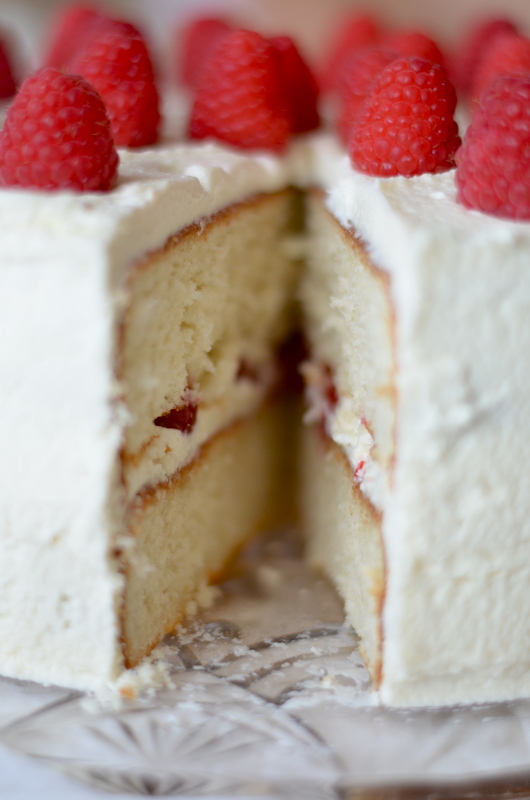 You could also just do a layer of jam or a homemade sauce throughout this layer (or chocolate/caramel)…the list goes on and on! 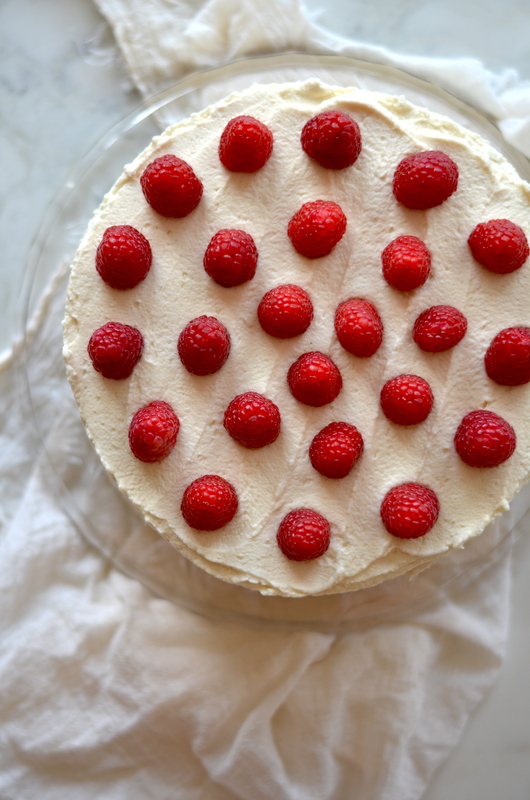 Whether you’re looking for a cake for a party or celebration or just feel like making a cake for no reason (that’s what I did), I recommend you try this recipe as soon as possible. It’s delicious! And no one has to know if you eat the entire thing on the couch while binge watching Netflix. I promise you won’t be the first…. 2 Pints Raspberries, Rinsed and Dried. For the Cake. Preheat oven 350 Degrees and position racks into center of the oven. 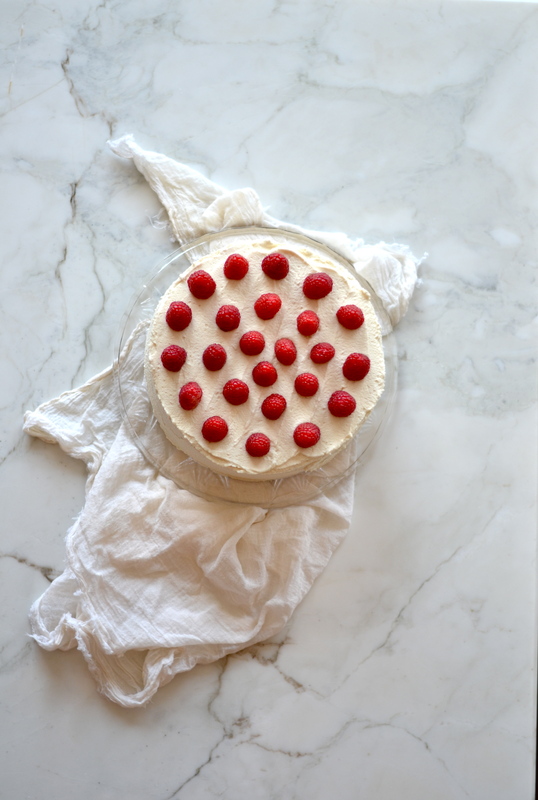 Grease the bottom and sides of 2 9″ round cake pans. 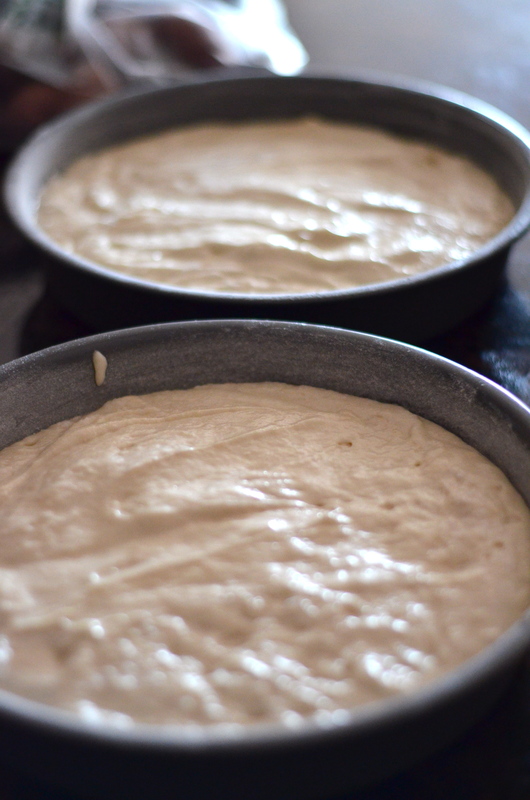 Line the bottoms with parchment and lightly flour the sides of the pan, tapping out any excess flour. 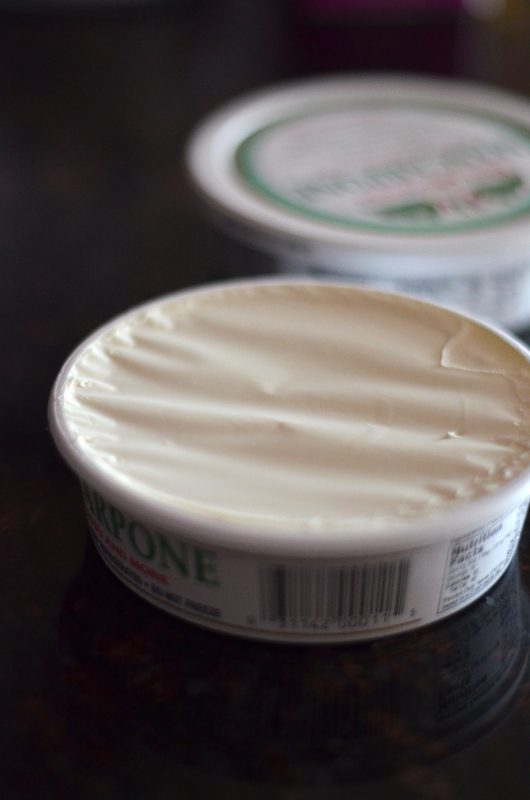 In a large bowl, beat butter on medium about 1 minute, until smooth. Add the sugar and vanilla. Continue to mix until well combined about 2 minutes. Scrape sides as needed. 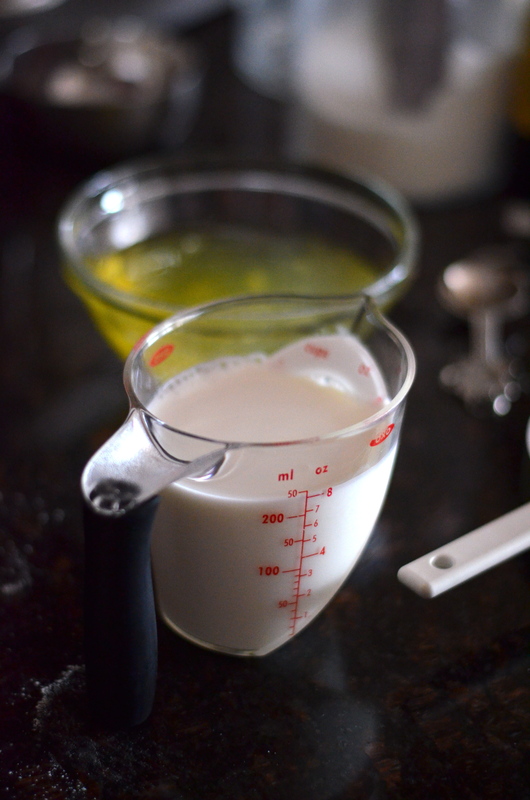 On low, add in the dry ingredients 1/3 at a time, alternating with 1/2 cup of the milk at a time. 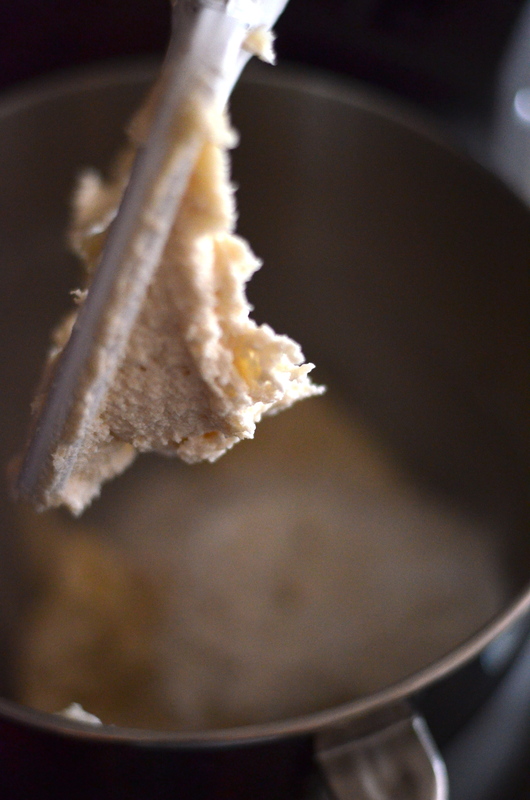 Begin and end with the flour and scrape sides as needed. 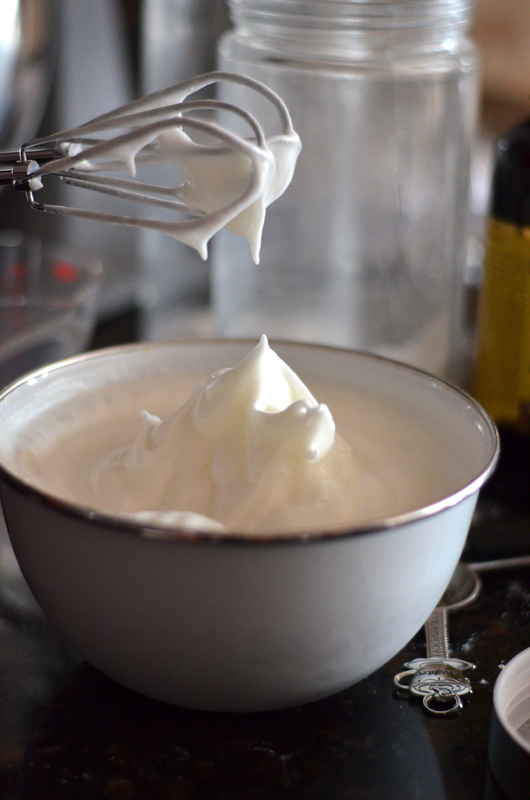 In a medium bowl, beat the egg whites with an electric mixer until soft peaks form. Increase speed and add 1/4 cup sugar. Continue to beat until medium firm peaks form. Scoop the whites into the batter about 1/4 at a time. Gently fold the whites in until just blended. Scrape batter into prepared pans and bake about 30 minutes. Let cool, run a knife around the edge of the pan and invert onto a rack to finish cooling. 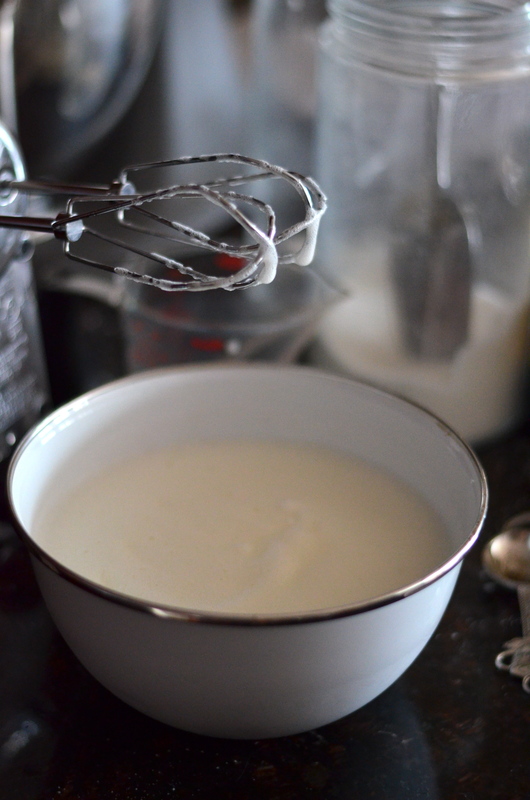 In a medium bowl, combine mascarpone, cream, sugar, vanilla and salt. 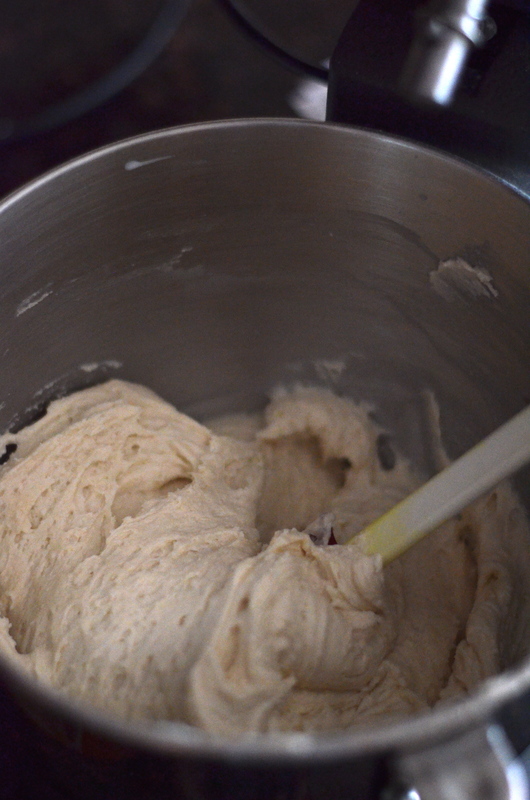 Beat on low speed with an electric mixer until smooth, no more than a minute so it doesn’t turn too grainy. Set one cake layer down on a plate, top side down. 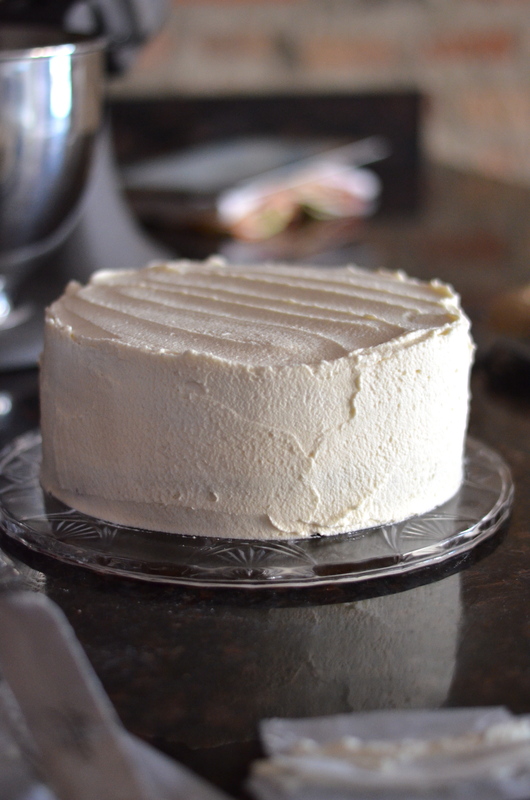 Place parchment in strips along the bottom if you would like to keep frosting off the plate. 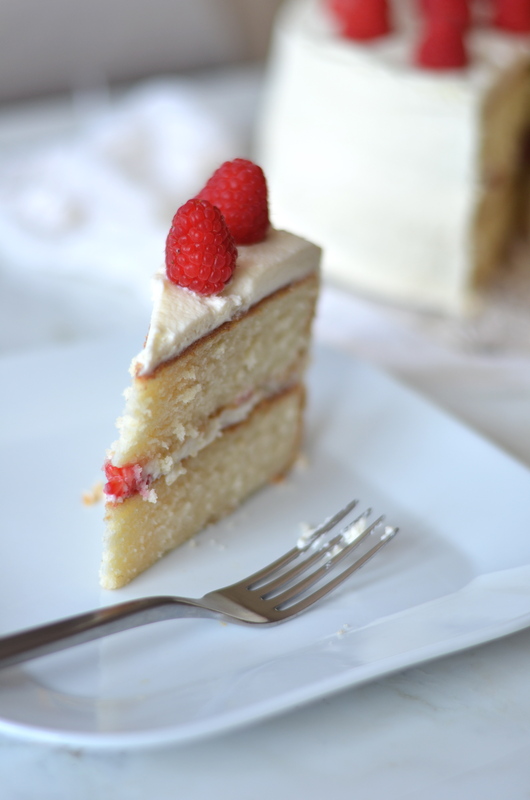 Use a metal spatula or knife to spread about 2 cups of frosting over the top of the cake. 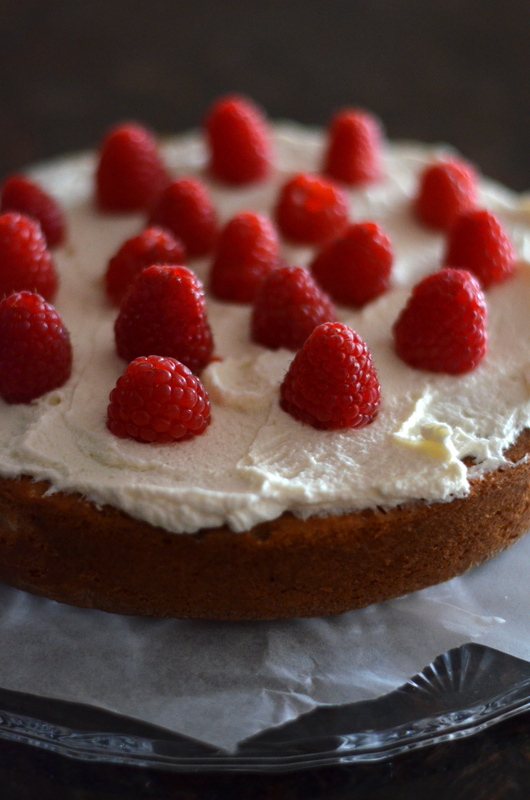 Arrange about half the raspberries on the cake leaving a half-inch ring around the outside of the cake. Place the second layer on top and continue to frost with a thin layer for the crumbs. 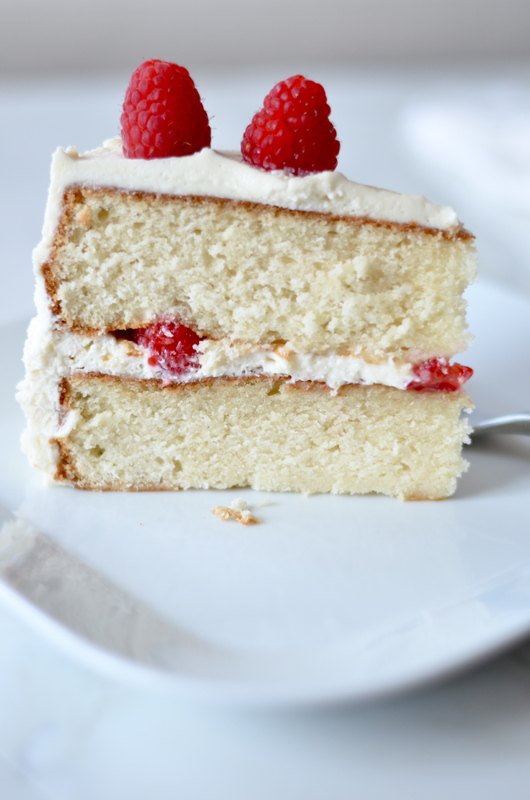 Place in fridge for about 5-10 minutes for crumb layer to harden, then remove and finish frosting. 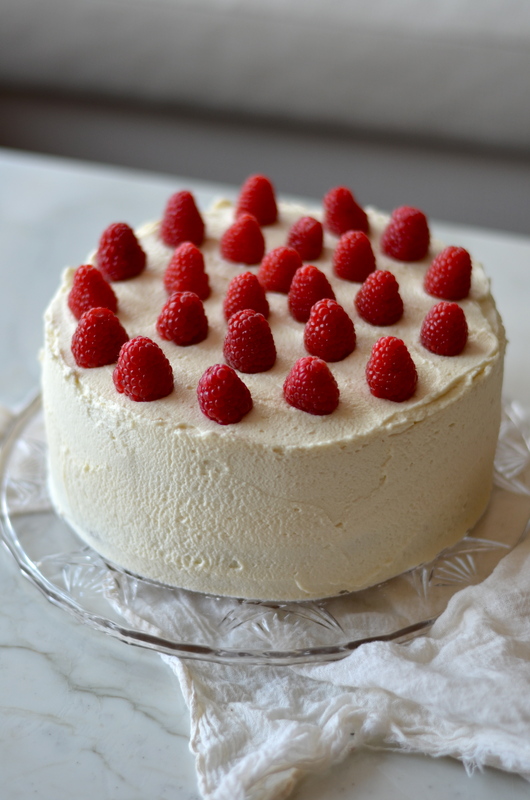 Top with remaining berries and refrigerate for 4 hours before serving. Serve at room temperature!. exquisite! Beautiful photography as always. mmmm, looks too beautiful to eat! I will most definitely try this recipe some time. 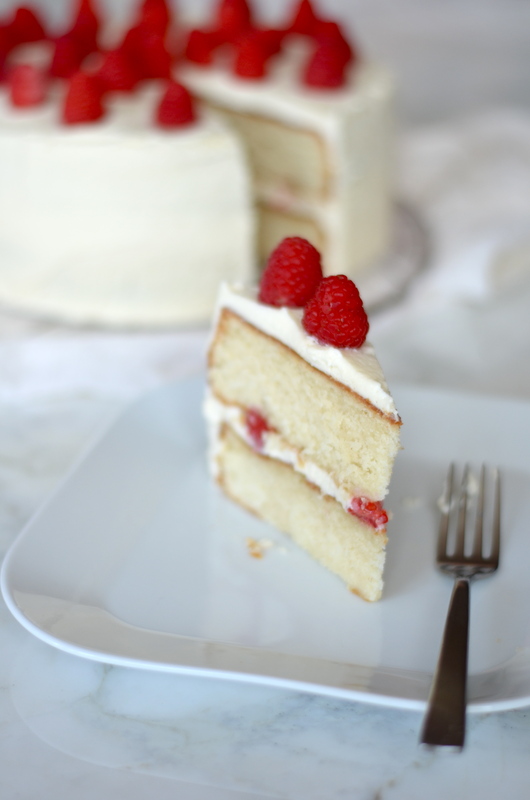 Reblogged this on Let them eat cake!. YES! I seriously think everyone will love it! Have fun! hey Bethany, thank u, Yeah is a nice blog, and i see u have many recipe to start cooking again 😊☺☺. 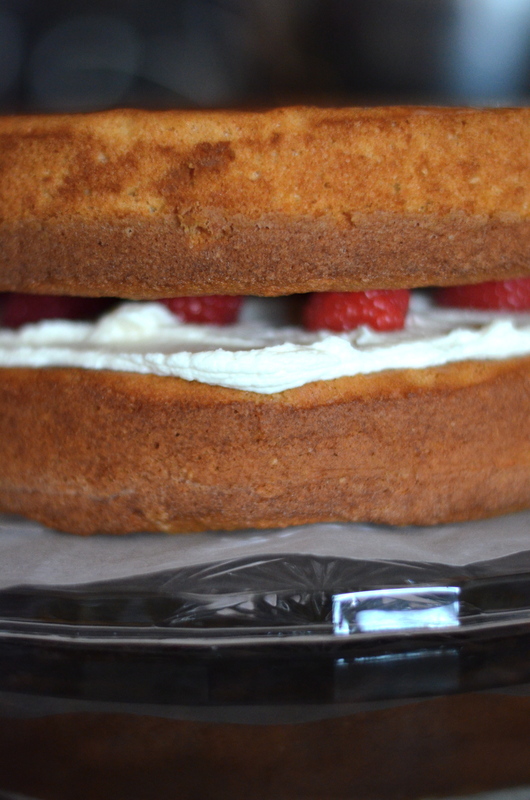 Great if u make a big cake is will be fantastic. 😀😀have a great nigth. 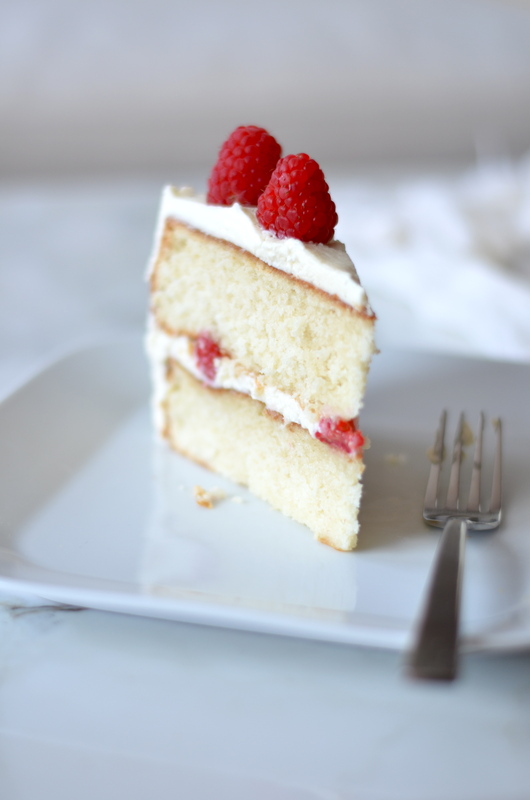 correction dont eat all cake save a piece of slice. Love your blog! I’m just getting started with my own blog and you have been such an inspiration! ❤ what kind of camera do you use?? that’ great, i will try to makr it. thanks!